Designed for fuel economy performance and to provide ultimate levels of power especially for recent gasoline designs. Suitable for turbo or naturally aspirated gasoline engines equipped with catalytic converters. Suitable for all gasoline engines using leaded or unleaded gasoline, LPG, autogas fuel. All driving conditions: city, road, highway. Motul H-TECH 100 Plus 0W20 is a 100% synthetic engine lubricant designed for fuel economy performance and to provide ultimate levels of power especially for recent gasoline engine designs. It is suitable for turbo or naturally aspirated gasoline engines equipped with catalytic converters. 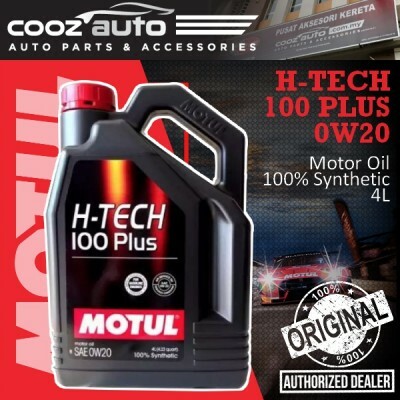 Also works best with all gasoline engines using leaded or unleaded gasoline, LPG, autogas fuel. Compatible with E85 fuel. Works well for all driving conditions: city, road, highway.